The Applied Machine Learning Days was a four day conference at EPFL in Lausanne at the end of January 2019. Following on the previous post on open data standards for machine learning, this post focuses on the AI & Health and AI & Cities that I participated in. "Respondents have a tendency to search for information and rarely use statistical or mathematical models. Additionally, their data sources are diverse." Earlier in this blog there have been many discussions of the open health topic, something that I am pursuing primarily through Opendata.ch and a new working group at the Society for Public Health, as interfaces to collaborating on projects in health topics. It was a privilege to be able to participate in the AI & Health track at AMLD moderated by the intrepid Marcel Salathé and @sunilmallya. You will find my notes on this topic further down. My new focus in 2019 is ramping up work on the SmartUse platform for data flows in urban development. AMLD was host to half of our new startup team, and allowed us the chance to participate in a workshop about the governance of city planning, explore opportunities for open source collaboration, and talk to practitioners about data standards and leveraging A.I. tools for Civic Tech. We were blown away by the quality of the presentations in the track run by Konstantin Klemmer, Shin Alexandre Koseki and Nick Jones. Here are some of our raw and crowdsourced impressions. Books were discussed, like Art is Open Source - The Near Future of human mutation, explored through arts, technologies and networks. Open data portals like datai.piemonte.it - an Italian project whose developer talked about. At Swissinfo or Republik you can read up on a referendum on zoning laws in Switzerland which was on the minds of many while the conference was happening, definitely a topic for us in the crowd. The impressive visuals and statements above were delivered by Christopher Nowzohour from Teralytics. A snapshot of one of the really neat projects displayed in the poster session outside. Read the paper here about assessing statistical similarity and analyzing the privacy tradeoffs. Another really interesting poster - on a topic closely related to my workshop - was from the medical informatics platform of the Human Brain Project, which you can find here. I dipped out of the Cities track briefly to hear Maria Schönholzer speak about "Deep Learning for Land Use/Cover Statistics of Switzerland". Labels matter. Who observes matters a lot. The insights of Daniel Gatica-Perez were down to earth and super insightful. His paper Looking South: Learning Urban Perception has a good overview. As does No Classification without Representation, and the IDIAP project Dusk2Dawn: Characterizing Youth Nightlife Spaces, Activities, and Drinks. 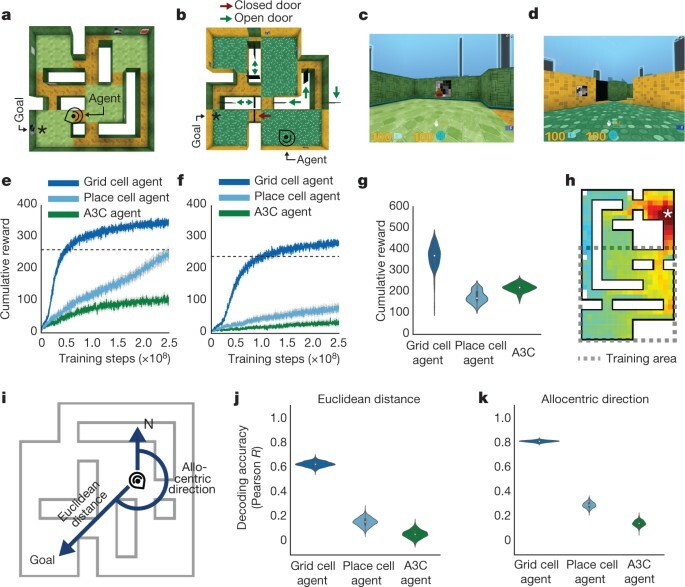 "Grid-like representations emerge spontaneously within a neural network trained to self-localize, enabling the agent to take shortcuts to destinations using vector-based navigation." Piotr Mirowski's presentation drawing from his experience on the Google DeepMind project was spectacular. The way he described using deep dreaming to gain insights from ML data seemed like science fiction - but is clearly science fact. Pro tip: you can request access to the StreetLearn dataset. - How we use AI in society is a political choice. We need everyone at the table. Elaine's talk the next day in the AI & Health track brought this message home with clear examples of how to design participative and impactful urban civic tech projects. "1 in 20 Google searches are health related"
Said Evgeniy Gabrilovich, to explain the rationale behind Symptom Search and other projects he works on at Google. An illustrative paper on one of the public health topics in this talk is the Nature Digital Medicine review on Machine-learned epidemiology: real-time detection of foodborne illness. And another interesting project discussed was the Twitter-based reporting @HealthMap_Food project. Visit #AMLD2019 for visuals, drop oleg @ TLD a line if you have any questions, and don't miss my previous post on data standards for machine learning.